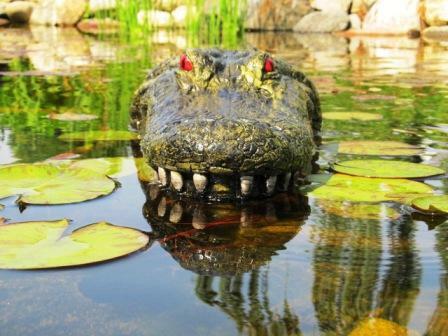 This 28½ inch floating alligator floats freely and life-like in the pond or pool. The 28½" long x 8½ " head moves realistically with the wind and water. Birds think that they're being followed by a predator so they leave for a safer area. 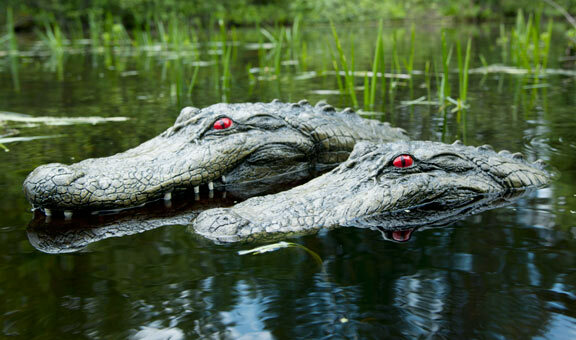 The Gator Pond Decoy measures 28½" x 8½" x 5½" high. From Michael Ellis of Mascotte, Florida on 4/28/2016 . From Paula of Las Vegas, Nevada on 5/4/2015 . From Tina Raper of Strafford, Missouri on 8/13/2013 . From Ronald Smith of South Wales, New York on 8/13/2013 . From Alli of Not Listed, Kentucky on 7/31/2012 . 6/4/2018 – Does it have an anchor hole on the bottom?